I've written about producers Stock Aitken Waterman on a number of occasions already, but 1987 really was the year they took over the charts - not only in the UK, but here in Australia as well. Many of my favourite songs from 1987 were produced by the trio and although I haven't been talking about most of them on this rundown (but linking instead to where I've previously covered the songs), they really did monopolise music. With another of their many singles from 1987, it's the criminally overlooked (in this country, anyway) Five Star. My favourite song of theirs, "The Slightest Touch", was remixed from the SIlk & Steel album, and shot to number 4 in the UK, where it would be their final top 10 hit. The siblings' career slowly dwindled until the start of the '90s - and ever since they've staged various comeback attempts and retro festival appearances. Bananarama aren't known for their slow songs, but this single - the final released from the True Confessions album - is among their best. Coming after "Venus" and "More Than Physical" and before the WOW! album, it was their only non-SAW-produced effort in the second half of the decade - but the track did receive a remix by the Hit Factory, which was basically a mash-up of this song and Princess' "Say I'm Your Number One". With her second single, Debbie would score another US top 5 hit, her first UK top 10 single and break into the Australian charts in 1988. Even bigger achievements were to come, with the teen star becoming the youngest artist ever to write, produce and perform a US chart-topper when fourth single "Foolish Beat" reached number 1 on the Billboard chart. It took me a couple of singles to get into Wet Wet Wet, since I liked (but didn't love) their debut song, "Wishing I Was Lucky" - however, there was no denying the catchiness of this follow-up, which became a favourite of mine when it finally saw the light of day in Australia. Forever now associated with (and, by some, hated for) 1994 mega-hit "Love Is All Around", Wet Wet Wet's best songs came from the period of 1987 to 1992, long before the Four Weddings And A Funeral theme tune came around. Bridging the gap from Wham! to Faith, George teamed up with the Queen of Soul for this worldwide smash. Back in 1987, a duet like this was big news - unlike today, when collaborations are the rule rather than the exception. I also seem to remember it being reported that George had to travel to Aretha to shoot the music video since she has a fear of flying. While the song (co-written by one half of Climie Fisher) was another number 1 for George, it also continued the string of hits Aretha had been enjoying since her return to success in the mid-'80s with "Freeway Of Love". Since "Don't Leave Me This Way" had been such a massive success, it made sense for Jimmy Somerville and Richard Coles to record another high-energy cover version - and they chose this song, previously recorded by The Jackson 5 and Gloria Gaynor. While it did the trick (reaching number 4 in the UK and number 13 in Australia), it also highlighted that the duo's original songs weren't performing anywhere near as well, and the group went their separate ways in 1988, with Jimmy going on to a solo career. The second of two tracks in my top 20 for the year by the Aussie band, "Revolution Love" came out as the third single from Terrain in December 1987 but would only limp to number 44 nationally. It was a shame to see a band who'd had a pretty good run with their debut album struggle second time round. The video version of the song (which I assume is also the 7" mix) is different from the album version I have - and I hold out hope that it will one day turn up on iTunes. 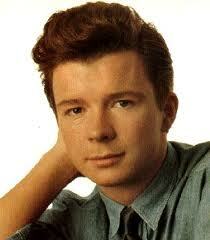 Here it is: the song that launched Rick Astley's very successful - albeit relatively brief - chart career. It's also a song that has gained a new lease of life in the last few years thanks to YouTube and "Rickrolling". I'm going to see Rick when he tours Australia in a matter of weeks and I'm looking forward to hearing this performed live. I've got my fingers crossed that he'll a) perform it faithfully and not try to strip it back or turn it into a ballad, and b) do his little shuffling dance from the music video. My favourite song from the 'Rams for the year, "Love In The First Degree" would also be the last song the original trio would perform live together before Siobhan left the group shortly after their appearance at the BRIT Awards in 1988. The video - and BRITs performance - was pure camp, but Siobhan sought a more serious direction and decided to move on from the group. Although Bananarama went on to enjoy more hits (including my all-time favourite song of theirs in 1988) and still tour today (mostly as a duo, although Siobhan rejoined Sara and Keren for some dates in 2017), the group was never the same again. It would be the biggest-selling single of the year in Australia in 1988, but I grabbed my 7" single of the theme from Dirty Dancing as soon as it was released in November 1987. I also saw the film by myself while my family was on holidays in Nelson Bay that summer since my older sisters weren't interested in seeing it. That's just the way I rolled. Buying 7" singles was something I'd only recently started doing since up until that point I'd only ever bought albums. "(I've Had) The Time..." wasn't my very first 7" purchase, though - that song is still to come! Proving that her solo success was no one-off, the former Go-Go stormed back with this lead track from her second album - and it would go to number one all over the world, except in Australia, where it would stall at number 2 in early 1988. Released in the dying weeks of 1987, "Heaven Is A Place On Earth" would also be the first of a consistent run of hits for Belinda until 1991. I don't know if I'm making this up (although this site would suggest I'm not), but at the time I seem to remember there being some discussion around this song's intro sounding an awful lot like the opening to Bon Jovi's "You Give Love A Bad Name" - and, as you'd expect, mash-ups of the two tracks can now be found online. Here we are: the last song I'll talk about on this countdown and the first song I ever bought on 7" single. I'm quite pleased that my first single purchase was a relatively interesting one. Sure, "Bridge To Your Heart" was a hit in Australia (reaching number 17), but it's not like I bought "He's Gonna Step On You Again" or something, so I'm quite proud of my taste as a 12 year old. Wax were Andrew Gold and Graham Gouldman, and they'd previously released another song I liked, "Right Between The Eyes", in 1986 - but the "Oh-oh-oh" refrain of "Bridge To Your Heart" made this a must-have record for me. Sometimes it's the simplest things that are the most effective!